Paris, Bibliothèque Nationale, nouv. acq. lat. 2170 > Cassianus’ Collationes Patrum > dated c. 928 + 11th century. Cassianus’ Collationes Patrum was not as popular throughout the Iberian Peninsula as the Beatos or the Moralia in Iob, medieval best-sellers of the last Codex of the month posts. However, codices with this work were also well-known and spread. The Collationes is a compilation of 24 texts, dialogues or conferences, in which several characters introduce the reader to the teachings and precepts of Oriental monasticism. Iohannes Cassianus (c. 365-c. 435) summarised on this work the principles of Eastern monasticism, as he lived them on his pilgrimage to the Egyptian hermits with his master and friend abbot Germanus of Bethlehem, introducing thus them into Europe. © Paris, BN, NAL 2170, fol. 120v. Detail of explicit, incipit and index. Each collatio has its own incipit, an index with number and title of each cap., and explicit –for example, collatio tertia ‘conlatio abbatis Pafnuntii’ = 22 cap. = incipit + index in fol. 7r and explicit in fol. 16r. (fol. 236v) “Explicit conlatio abbatis Abrahe de mortificatione. Finit liber conlationum editum a beato Cassiano. Deo gratias”. © Paris, BN, NAL 2170, fol. 236v. Prayer in honour of Sancti Martialis. (fol. 236v; Gothic script) “Incipit uita sancti ac gloriosissimi Marcialis episcopi Equitaniorum primi patroni Lemouicensium ciuitas, qui obiit pridie kalendas Iulii” (fol. 237v with the same version written in Visigothic script). * The codex has a large collection of glosses, emendations, and some other notes (synonyms), from the 11th century mostly. © Paris, BN, NAL 2170, fol. 6r. Detail of notes. * Order of copy: Collationes -> Vita -> Prayer (on a verso left blank). Support: well-preserved text, although many leaves have been damaged by humidity lacking almost all external margins. Only half of the inner column is extant for fol. 165. Modern binding of brown leather. No. of leaves & layout: 259 fols. (370 x 270 mm); two columns-35 lines for the first part and two columns-31 lines for the second one; quaternions; ruled in dry point (two vertical lines defining the outer margin of the writing box and a vertical line in each column in the inner area; 2-1-1-2; the pricking for those vertical lines easily found). © Paris, BN, NAL 2170, fol. 53r. Detail of pricking and ruling of the page. The chapter of each collatio is sometimes referred to in the upper margin of the folio. There are some subtle differences in the layout used by each scribe. Thus, for example, in collatio nona (second scribe), the numerals for each chapter go in the intercolumn space and not within each column. Copyist/s: At least six copyists. Working in the second decade of the 10th century: fols. 1r-38r, fols. 38r-96v (identified as Alburanus, fol. 87r), fols. 97r-146v, fols. 146v-233v (identified as Iulianus). Working in the 11thcentury: fols. 234r-236v and fols. 237r-255r. 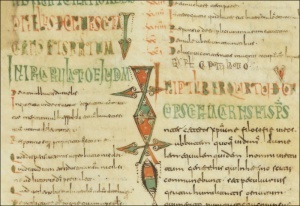 In the first part of the codex, there are also some 11th-century additions on fols. 128v (editing faded ink) and 148v. (fol. 87r) “Explicit conlatio abbatis Isaac secunda de oratione. Deo gratias. Expliciunt conlationes X sanctorum Adelladio et Leontio episcopis. Incipiunt alie VII ad Honoratum aepiscopum et Eucerio famulo Christi. Amen. Deo gratias. Hec sunt in hoc codice conlationes numero VII, abbatis Ceremonis conlationes III, abbatis Nestoris conlationes II, abbatis Iosep conlationes II. Incipit prefatio. O pie lector Albunari scribtoris memento“. * Each chapter header highlighted in red ink mostly, sometimes in green, and copied by the same hand that its text. Collationes Patrum: This part of the manuscript contains a number of small decorative initials or litterae notabiliores in green, yellow and red as part of incipit and explicit. Seem that their style slightly changes between hands, especially between the first two and the third one, less elaborated. In some of these initials, small figures were added within; especially in those corresponding to the third hand. © Paris, BN, NAL 2170, fol. 66r. Vita Sancti Martialis: On this second part, initials were also highlighted in red, green, yellow and blue but in a continental style. Script: For the first part, Collationes, Visigothic minuscule script; for the second part, Vita Sancti Martialis Episcopi, Visigothic minuscule script with some slight graphic influence from Caroline minuscule. © Paris, BN, NAL 2170, fol. 38r. Detail scribe 1 vs. 2 of the Collationes. Origin: All seems to indicate that the codex was copied at the monastery of Santo Domingo de Silos (Burgos), at least its second part and the glosses–without a thorough graphic analysis, the scripts of the 10th and of the 11th seem to differ enough as to possibly belong to two different production centres of the same cultural level. Provenance: Santo Domingo de Silos? 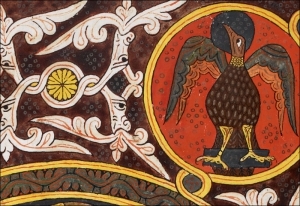 ; this codex was in the monastery’s archive in the 18th century. Context: Cassianus’ works were fundamental readings about monasticism in medieval Europe. How institutions should be managed and how the ascetic experience must be understood as useful for a better comprehension of God and the nature of His word. During the 9th and 10th centuries, both Cassianus’s Collationes, as well as his Institutiones, were read and copied in the Iberian Peninsula: we have 10 extant codices, four Institutiones and six Collationes all dating from that period ((you can find them on the Excel list of manuscripts here). And the interest on these works was not geographically focused on one place, but rather widely spread throughout all the Visigothic ancient kingdom: from Córdoba to Barcelona, including Burgos, Zaragoza, and La Rioja, monasteries from very different backgrounds read and annotated, Cassianus. © Paris, BN, NAL 2170, fol. 148v. Detail 11th-century additions. As far as I know, although the content of this codex has been extensively studied, the several hands who collaborate on its copy have not. Therefore, a further study of each of these scribes would be interesting, especially bearing in mind their collaboration dividing up quires and content. 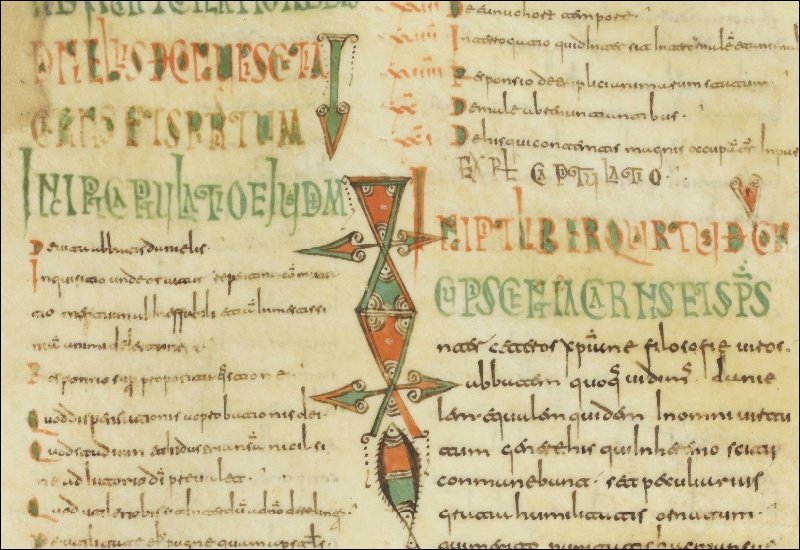 If both parts of the manuscript were written and annotated in the same production centre, Silos, their graphical study would also bring light about the evolution of the script in there from the early-mid-10th to the late 11thcentury. M. C. Díaz y Díaz, Códices visigóticos de la monarquía leonesa, León 1983, 454, nº 188. A. Millares Carlo, Corpus de códices visigóticos, Las Palmas de Gran Canaria 1999, nº 262. A. Millares Carlo, Tratado de Paleografía Española, Madrid 1932, 568, nº 215. More on Cassian -> Tzamaliko, P. 2012. The real Cassian revisited: monastic Life, Greek paideia, and Origenism in the sixth century. Leiden.